As I was shopping for some fresh and new travel gear, I thought about how much money I had already spent on travel gear. It’s pretty ridiculous. $250 for a duffel bag, another $100 for a backpack, another $100 for clothes and more. This time around, I’ve sharpened my online buying skills. I put a lot of time and effort in, but it’s worth it. Here are 5 tips that I use to save money on buying travel gear. At the checkout of almost every online store, there is a bar where you can type in your promotional code or coupon code. Most of the times I won’t have one, but that’s why I search the internet for them. There are hundreds of websites solely dedicated to providing recent coupon codes to online shopping freaks like me. Most of the times the codes provided are expired, but every once in a while you will find a working code that will save you a good amount. It’s all about trial and error. Tip: Lots of coupon finding websites seem really spammy. Be careful where you get your coupons from. When you subscribe to the newsletters of gear companies or retailers you’ll be constantly up to date on the latest deals. Subscribing makes it easier to find the best prices, because you can save time not having to check the retailer’s site to know when there is a deal. The companies are doing the dirty work for you. Tip: Sometimes when you opt-in to a company’s newsletter, they give you coupon codes to get a percentage off of your next purchase. Sites like REI.com do this. Physical stores are for trying gear out. Online stores are for buying. By shopping online, you will have access to gigantic selections of gear and the prices are usually better. Take the time to search online for the best prices. A little bit of effort put in can save you a good amount of money. Taking your time to buy a product is also a good idea. Wait until times when you know there will be a sale, like on Black Friday or Cyber Monday. Black Friday shopping online isn’t nearly as stressful as when camping out, plus the prices can be just as good. Tip: Company newsletters won’t always send you information about things that you really need to know. In that case, you are better off manually searching. It hurts me to write this, but it’s true. When traveling, you don’t always have to get the best gear. You probably won’t need a bunch of the features that the highest tech gear have. The chances are that your gear will get messed up, lost, stolen or even mutilated while traveling. You’re probably better off saving the money and spending it on experiences and memories that can’t be lost. Tip: It’s ok to splurge if you know that you need the features, and/or you are the type of person who doesn’t lose stuff. It’s pretty simple, but effective. The only thing that you really need to do is sign up, then follow the links. They track your order so that they know to refund you. It’s a really great concept, however it does have its drawbacks. At times, the tracking doesn’t track, and then you won’t get your money back. This has happened to me a couple of times. One time, customer service refunded me, but the other time, they couldn’t do anything about it. The other downside is that the rebates are really low. For most websites, Ebates.com will only refund you from 2% to 10%. In total, I’ve been refunded $22.34. You can sign up for an Ebates account here. P.S. If you sign up through link, I will get a little compensation. 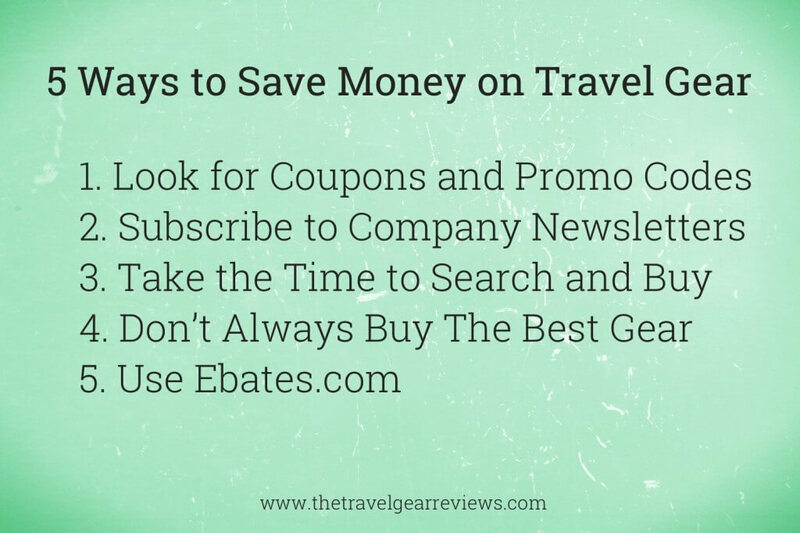 Those were my 5 tips on how to save money on travel gear. I hope this article helped you with your travel gear buying. Happy online shopping! How do you save money when buying things online? Leave your comment below. A good travel gear does make a difference, but splurging is not a good idea. I like your tips! Zwar schon älter, dennoch immer noch sehr hilfreiche Tipps. Vielen Dank dafür. These are great travel tips.